Busy but fun. I have students in my workshop every day, with amazing own projects. I don’t just tech them, but sometimes learn from them. Well.. maybe you don’t wait this sentence from me, but I consider myself humble enough to recognize talented people. So.. Let me introduce Kristiana Rada here! She spent two weeks in my workshop, and I can tell: never seen anyone with so much energy, and creativity. OK, She is a professional shoe designer, so creativity is something what you would wait from her, but making a whole collection one night – that is something, no? Here are two works she finished in these days. Good work Kristiana! 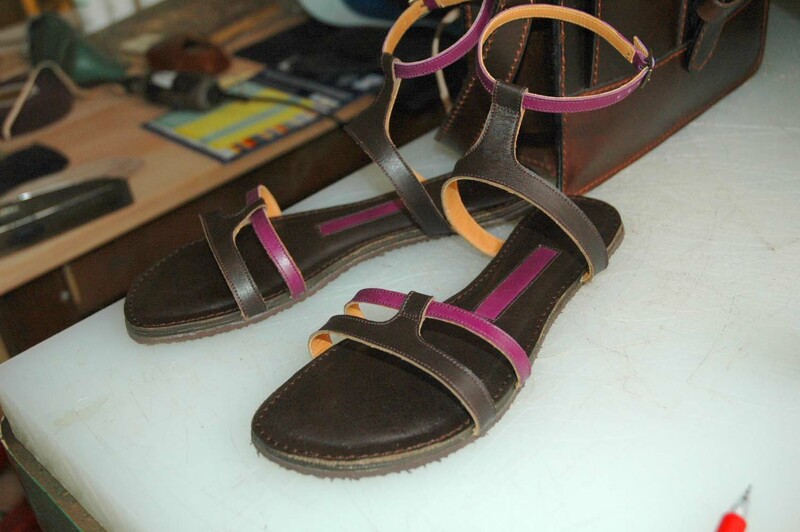 Did I mention that I never made sandals? Not a big deal, just a perfectly different technique.. interesting stuff. Beautiful sandals!! I would wear them in a moment! marcell.. .nothing about ur two fav students for Feb. Daniella and I. we are very sad now. esp since u took those awful photos of me trying to get those damn shoes off the last. and lets not forget, my multiple lacerations with the awl, the needle and the blood on the soles….. Your shoes are very good. I would like to join the course 1 day.